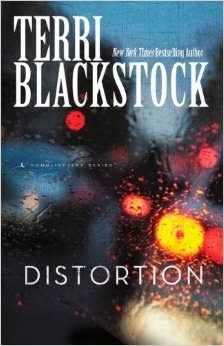 Terri Blackstock is joining my list of favorite authors, so I was thrilled to review her newest book, Distortion. This title is the second in the Moonlighters Series, and was every bit as fabulous as the first in that series, Truth Stained Lies. Probably better, actually. In Truth Stained Lies, I was introduced a group of sisters, who end up "moonlighting" as investigators when their brother lands in jail, suspected of murdering his ex-wife (or estranged wife, I don't remember for sure at the moment). The sisters are again involved in investigating this crime, and it leads them to all kinds of places they didn't want to go. I love a good mystery, and this fits the bill. A good Christian mystery is even better, and this fits that bill too. Imperfect people, many of whom are believers, mostly doing the best they can. The situations can seem a little far-fetched at times, but not enough to be unbelievable. And a lot of the twists and turns of the investigation are things that you can sort of see coming, but usually only a half-step ahead of the characters. That's always nice. Since this is the second book in a series, the big question I always have is, "Do I have to read #1 first?" I do think this title mostly stands on its own, however there are at least a few things that wouldn't make a lot of sense without knowing the previous story. Not enough to truly detract from the tale, but my recommendation would be to try to start with Truth Stained Lies. One thing I really did like about this title, though, is that it is not a murder/romance. Not that there isn't a bit of romance involved, but it comes across as part of life, not a central focus of the story. Can't wait to see the next in this series, only hopefully it won't have to involve another murdered family member.